The family did not know what hit them. Stephon Clark’s grandmother knew she needed to get everyone down on the floor and stay there as 20 bullets were rapidly unloaded into their backyard. She did not know the gunfire was from Sacramento Police Department officers. She did not know that her beloved, unarmed grandson lay face down with several bullets in his back. She did not know that forensic evidence would confirm that he was still alive and that police body cameras would confirm that he did not get any medical attention in those critical minutes when he lay there, bleeding to death. Black families across America are wondering what more advice they can give to their children to help them navigate this epidemic of unarmed black men being killed by police. Killings where the police invariably go unpunished. They have told their children all the right things to do if stopped by police, and now they have to tell them that they have to stay home after dark? This is the profound trauma felt by black families across the nation which deepens with Stephon Clark’s name. Despite mass anger and protest, the list of names of those unarmed black men killed by police officers has not stopped growing. The thoughts and prayers of Mayors and city officers, not to mention body cameras, continues to do nothing to stop the bullets. The movement re-ignites over and over again. Each death threatening unrest. The movement against police brutality has to look to new tactics to make change to add to demonstrations and direct action. Kshama Sawant, the socialist City Councilmember in Seattle, shows that more can be done. She called out police violence and is now being sued by two police officers; two officers whom the justice system protected. Our movement needs real, democratic control over police departments, not just the face at the top. We need democratic control over policing methods and we need to elect those that are not afraid to fire racist or violent officers who should not be on the streets. Black Lives Matter and the growing anti-police brutality movement in Sacramento has already prevented an NBA game, stopped a City Council meeting and blocked major freeways. The energy and optimism of the marchers was captured in the chant, “I know that we gonna win!” Footage of Stephon’s brother, Stevante, defiantly sitting on Mayor Steinberg’s desk with his back to the Mayor yelling his brother’s name to a packed council chamber has been viewed hundreds of thousands of times. Stevante began his speech that night with “the rent’s too high” connecting gentrification with the proliferation of police murder that some have called genocidal. Stevante spoke about the slave past that black people have not been allowed to walk away from. Already in March, 269 people have been killed by the police in the U.S. in 2018, according to The Washington Post. Since 2016 Sacramento Police have killed six people, five of whom were black men, despite black men representing less than 7% of the city’s population. It is in this context that Stephon’s family immediately moved to get an independent autopsy. The nationally renowned Dr. Bennet Omalu, whom Will Smith plays in the movie Concussion stepped in and was able to shine light on what actually happened on the night of March 18. Having any kind of independent access to evidence was a huge victory against the police department. The evidence is now in, Stephon was shot eight times, mostly in the back. Forensic results entirely contradicted the police officers’ story of the event. They had argued that Stephon had advanced towards them representing a threat. The phrasing they used is not accidental. This is almost the exact cookie-cutter language that has has led to the acquittal of the vast majority of police killing episodes in America. The Supreme Court has ruled that a police officer can use deadly force legally if they have a reasonable belief that their lives are threatened. 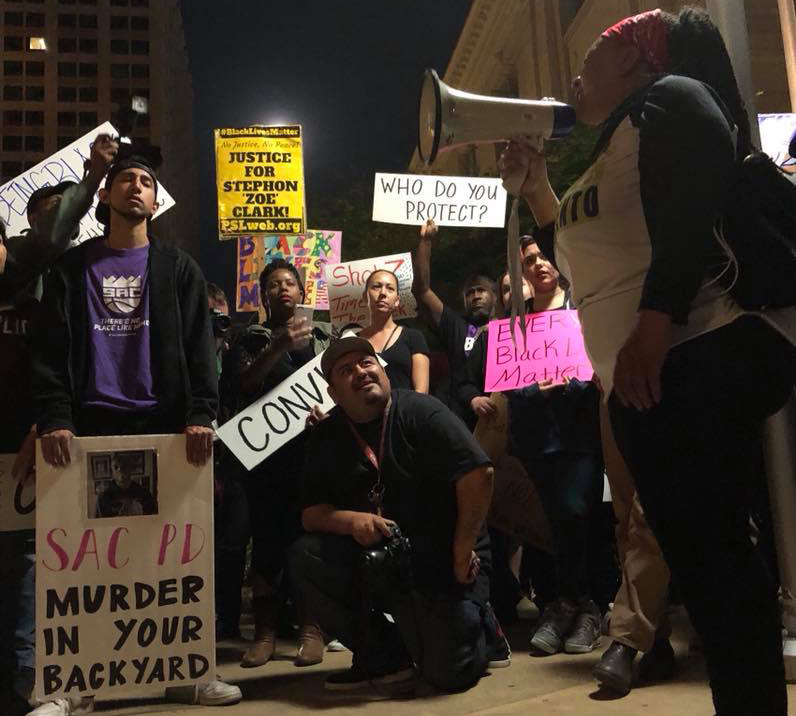 Much of the same outrage at the Sacramento Police Department followed the police killing in July 2016 of Joseph Mann. The police also responded quickly with a denial of wrongdoing. Eventually, they were forced to release their own dash camera footage which was far worse than anyone had imagined. Joseph Mann was suffering a mental health crisis and was standing in a road weilding a knife. The police that arrived, very quickly lost patience and then began to deliberately attempt to run him over. One officer can be heard encouraging the other to commit what to the rest of the population would be considered vehicular homicide. Unable to hit him with their patrol car, as Joseph Mann ran away, he was shot fourteen times by those two police officers. The struggle for the family to get to the bottom of the incident was blocked continuously by the police and the city council. In June 2017, almost a year later, Joseph Mann’s family were forced to sue a second time for the release of more information on the killing. Sacramento has gone further than many cities following the outrage caused by Joseph Mann’s death. In June 2017 the Mayor hired a new chief of police, Daniel Hahn, as the first African American to lead the Sacramento Police Department. The following December the city introduced a number of reforms. They mandated body cameras, guarenteed the release of dash camera footage within 30 days, had the entire police force go through de-escalation training and increased funding to the Office of Public Safety Accountability. However, as far as police being punished for their actions, they stopped short. All misconduct accusations remained tightly guarded with Sacramento Police Department’s Internal Affairs. While there is some accountability on who gets hired, who gets fired remains under the control of the SPD. The direction of the Sacramento Police Department ultimately falls on Mayor Steinberg. The Mayor is a leading figure in California’s Democratic Party, having led the State Senate for almost a decade before spending a record $1.6 million in his run for Mayor. During the Joseph Mann investigation, Steinburg said that the city would be “laser focused on the results of the ongoing internal investigation.” This did not stop the District Attorney from deciding that Joseph Mann was “lawfully” killed. And now, Stephon’s death is more evidence that little to nothing has changed. After Stephon Clark’s death, Steinburg stated, “it is our job to translate the anguish and grieving and historic pain (of the black community) into tangible and real change.” This corporate doublespeak will not stop the demands for real and tangible justice. Last year, the entire Sacramento police force went through a comprehensive crisis intervention training, yet this did not save Stephon’s life. It also did not stop the police from muting the audio on their body cameras when other officers arrived at the scene of the killing in order to figure out their stories so as to avoid blame for the potential crime they committed. There is enormous pressure to take this movement off the streets and into the allegedly safe channels of the court system. Corporate Sacramento wants to put a lid on the potential revolt. They will use whatever influence and resources they have to try to prevent a social uprising. Reverend Al Sharpton, who similarly pushed a legal-centered response in Ferguson which ended in a demoralizing defeat for the movement, spoke at Stephon’s funeral. Other public figures will come forward to argue for a demobilization of the angry, growing movement in favor of a what amounts to a frustrating vague surrender, packaged as peace. But as we have seen before, protest cannot be delayed indefinitely, neither can oppression be effectively fought in a legal system that is controlled by the oppressors. When legal tactics fail, there is enormous resulting mass frustration can be the spark that produces riots – which as Dr King pointed out, are the language of the unheard. A mass, determined but peaceful movement on the streets can force those in power to fire and prosecute the cops who killed Stephon Clark and turn the focus onto those that have overseen the systemic violence specifically against the black community. We need city councillors like Seattle socialist Kshama Sawant, who is currently being sued by two police officers for allegedly “defaming” them in the way she talked about how they killed Che Taylor. Hundreds of thousands marched against gun violence, responding to the call of the Parkland students where 17 of their community were slaughtered. The regular repetition of shootings are a sign that America’s culture of violence knows no end. The oppression of violence, for so long a dark cloud that rained down on the poor and communities of color, left unresolved, is also beginning to spill into the wider community. The sustainability and effectiveness of this struggle remains dependent upon a multi-racial grassroots movement rooted in working-class struggles, a willingness to discuss the trajectory of the movement, and developing ourselves organizationally and politically. A united working-class movement would utilize the method of mass protests, non-violent civil disobedience, walk-outs, and strikes, based on a program that puts people’s needs first, will be most effective way to fighting back and secure justice for the Clark family. Let’s not allow Stephon Clark’s death to be in vain. We Demand Justice for Stephon Clark! For a public independent investigation of the event with full and immediate access to all evidence carried out by community, Black Lives Matter, labor, and social justice organizations as a step towards an elected civilian board with full powers over law enforcement.